Venezuela, South America’s biggest oil producer, has seen the value of its oil exports fall to its lowest level since 2004. The economy faces hyperinflation and increasing shortages of basic goods. Debt default seems highly likely. 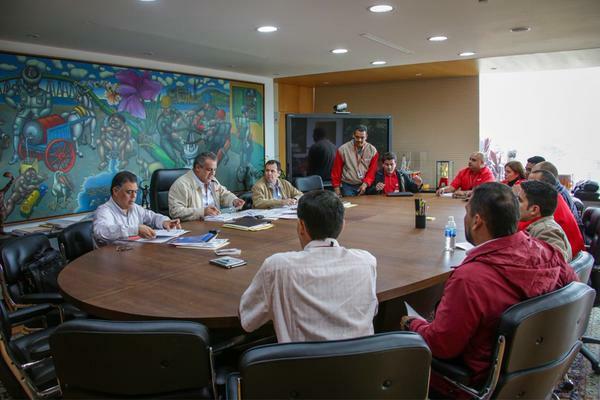 State oil company PDVSA has neither the institutional capacity nor the funds to expand oil production. It is a downward spiral that will lead to political change. This entry was posted in Faja of the Orinoco, Global Oil Market, heavy oil, Oil prices, OPEC, PDVSA, PDVSA weakness, Venezuela oil and tagged Eulogio Del Pino, Heavy crude oil, Nicolás Maduro, oil sector, OPEC, PDVSA, Petróleos de Venezuela, Venezuela. Bookmark the permalink. Hello Mario. Yes, I’d say so. I have spoken with industry executives and analysts who see a split taking place in the global market, between ample heavier-oil and now less-available lighter crudes. So, USA fracked tight/shale oil is light. Refineries generally prefer to have a mix of the two, to get a greater variety of hydrocarbon chain lengths from which a wider variety of products can more easily be refined. So, it would seem that both Canadian tar sands and Venezuelan extra-heavy are good partners to combine with the light US crudes. it is hard to put numbers on this, but it seems the shale revolution in the USA will not cut out desire to import a certain amount of these heavier crudes. And, light crudes will be in great demand generally, as I understand it. If the USA agrees to allow exports (which it undoubtedly will), it is not just a matter of its new light oil joining in international markets, it will also be quite desirable because oil being produced around the globa nowadays, even by the Saudi’s, tends to be heavier and heavier.